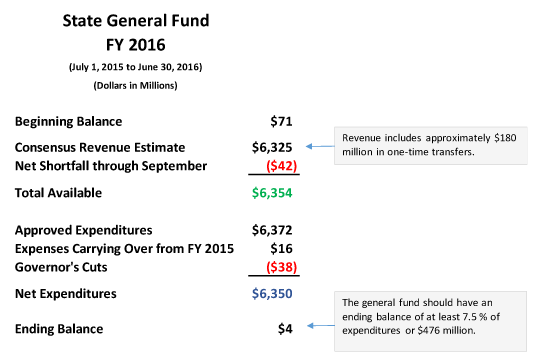 Three months into Fiscal Year 2016 the general fund’s fragile balance has evaporated. The FY 2016 budget is at high risk for mid-fiscal year cuts. If revenue continues to fall below expectations, the governor and lawmakers will have no choice but to take action to either quickly increase revenue or reduce current appropriations. The chart below shows the October status of the general fund. The general fund began FY 2016 with $71 million in the bank—far below a financially healthy level. A portion of that small beginning balance resulted from $16 million which remained unspent in FY 2015 because of project delays or other reasons, but the cash carried over to be spent in FY 2016. Tax revenue in the first quarter of the fiscal year was below expectations each month: $5 million down in July, $30 million in August, and $31 million in September. In late July, the governor ordered transfers to the general fund from the balances of other funds. Those transfers count as revenue, but even after including that extra one-time cash, general fund revenue is $42 million below expectations through September. Lawmakers approved expenditures of $6.372 billion for FY 2016 and gave the governor the authority to somehow cut $50 million from that total. The governor did make cuts at the end of July, but less than $50 million, choosing instead to enhance revenue with one-time transfers. Counting the cuts that the governor did make and the $16 million of authorized spending carrying over from FY 2015, expenditures for FY 2016 now total $6.350 billion. That leaves a minuscule ending balance of $4 million, assuming revenue comes as estimated in the remaining 9 months of the fiscal year. What if revenue continues to underperform? Recently, Governor Brownback announced that he would not seek tax increases or spending cuts. Then the only realistic option left is to transfer more one-time money from the highway fund or other funds. It’s important to remember that lawmakers have already approved more than $180 million of one-time transfers to prop up general fund revenue. Ongoing revenue is estimated to only reach $6.1 billion, but may fall short of that. However, even the conservative set of expenditures that lawmakers authorized totals more than $6.3 billion. Transferring more one-time money will not fix Kansas’s financial problems. The 2012 tax cuts were unaffordable and too deep. 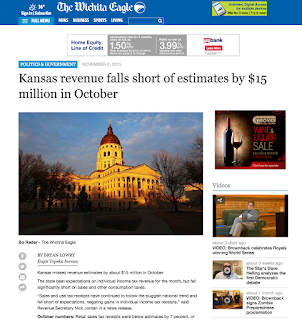 Even after the Legislature shifted more of the tax load to the sales tax, Kansas lacks a revenue stream that supports minimal expenditures, and our state continues to be in a perpetual budget crisis. — This column originally ran on the Kansas Center for Economic Growth website. What Does Financial Health Look Like?